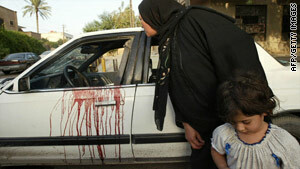 A woman peeks inside a blood-stained car in Baghdad, Iraq, after the shootout in 2007. (CNN) -- All but one of the families who lost relatives in Baghdad's Nusoor Square killings have agreed to settle their claims against the security contractor formerly known as Blackwater, one of the survivors said Sunday. Hassan Salman, who was wounded in the 2007 shootings, told CNN that 16 of the 17 families of the dead agreed to $100,000 lawsuit settlements from Xe, as Blackwater now calls itself. Those wounded were offered between $20,000 and $50,000 apiece, Salman said. Blackwater guards protecting a U.S. State Department convoy opened fire in Nusoor Square, in western Baghdad, in October 2007, killing 17 people and wounding more than two dozen. Blackwater denied any wrongdoing, arguing its contractors used necessary force to protect a State Department convoy that had come under fire from insurgents. Iraq called the killings unprovoked and an act of "premeditated murder." The incident led the Iraqi government to slap limits on security contractors hired by Xe and other firms operating in the country. Xe announced it was settling the lawsuit last week to allow the company, which is also under new management, to move ahead "free of the costs and distraction of ongoing litigation." One of the guards who took part in the shooting pleaded guilty to a voluntary manslaughter charge in a U.S. court 2008. Five others were charged with manslaughter, but those cases were dismissed in late December when a federal judge found prosecutors wrongly used the men's own statements against them.